Serving soldiers, an ex-serviceman and motorsport TV presenter Tony Jardine will drive a Mazda MX-5 in Britain's toughest race this weekend, the Britcar 24hr at the world famous Silverstone GP track in order to bring attention to five British Armed Forces charities; Help for Heroes, ABF 'The Soldiers Charity', The Forces Children's Trust, The Not Forgotten Association and Scotty's Little Soldiers. 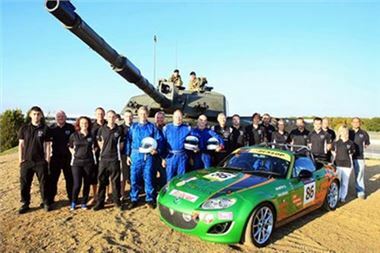 The 2nd Royal Tank Regiment (2RTR) is supporting the MX-5 Forces Team with pit crew as well as 14 'tankies' and a 65‑tonne Challenger 2 Main Battle Tank throughout the race weekend, which disconcertingly for the other teams is located overlooking Stowe, the first corner of the circuit. Other military support includes two helicopters - an Apache and a Lynx, the Red Devils Parachute Display Team, an inflatable assault course for the kids, an Army recovery vehicle and a PR trailer. "Having brought my Squadron back from Afghanistan in May, I was hugely thankful that we suffered no fatalities," commented Major James Cameron, MX-5 Forces Car Team Leader. "There were, however, casualties and some seriously injured soldiers and on our return I have been determined to help those who help our fallen, our wounded, and their families. We hope to raise the profile of Forces charities, highlighting five in particular who are special to us, and have been hugely grateful for the support that we have received." Tank Commander Sgt Matt Baldwin commented: "This is a fantastic opportunity for the Regiment to show its support for the Forces charities, whilst allowing the soldiers, all of whom are petrol heads, to enjoy a great weekend at Silverstone. We look forward to welcoming members of the public to come and see the Challenger 2 Tank and meet the soldiers, all of whom have recently returned from operations in Afghanistan." Major James Cameron was today recognised in the Operational Awards list, where he has been awarded a Mention in Dispatches for which everyone on the 24hr race team is extremely proud. To donate to the charities go to http://uk.virginmoneygiving.com/team/forcesMX-5 or text ‘Race24 £5' to 70070. Joining the MX-5 Forces Car will be the regular MX-5 and a second production MX-5 race car. The cars are expected to complete 1,000 competition miles in 24 hours making this the most gruelling race in the British motor racing calendar. The Britcar 24hr race starts on Saturday 1 October and the winning car will be the one that completes the most laps of the 3.666 mile circuit in the 24-hour period.